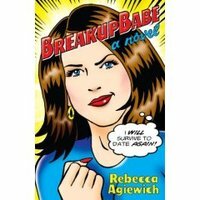 Breakup Babe: A Novel, by Rebecca Agiewich. If you've been reading my blog for a while, you may recall a day that lives in infamy, a day I call Black Thursday. It was on that day, April 14, 2005, that I was unceremoniously left by my surrogate cat, dumped by the girl I had just started dating, and kicked out of the band I was playing in, all within three hours. Rebecca Agiewich was innocently linked to one of those events, and if you read her most excellent blog, your first assumption might be that she was the person who dumped me. After all, it seems from her author bio ("Rebecca Agiewich lives in Seattle, where she has dated some of the cities most eligible bachelors and almost all of the ineligible ones....") that she has dated every single man in this city. But actually, I know Rebecca because she plays keyboards in the band that expelled me. Rebecca, however, knew nothing of my pending musical doom. It was others in the band who decided my travel schedule did not meet their rock star needs, and informed me via e-mail that my presence at rehearsal was no longer welcome. When I happened to bump into Rebecca the next evening at a comedy improv show, her face filled with shock and horror when I informed her that others in the group had sent me away. It just so happened that Rebecca had recently landed her first book deal, though, so in spite of my musical demise, she and I became writer pals. We get together from time to time to consume adult beverages and marvel at the mysteries of the publishing industry. Her novel has just been released -- based on her blog -- a hilariously honest look into the mind of a single 30-something female in the cyberage. "Breakup Babe" is the absolute funniest writing to hit the so-called "chick-lit" genre since... since... hell, I have no clue. She is the only "chick-lit" a man like myself who oozes machismo from every pore one or two pores would ever read. Seriously, I don't love her writing because she's my friend. I love her writing because she is a brilliant writer whose snarkalicious chick-lit wit can even make men cackle with delight. So there! There's another brilliant book for you to amuse yourself with for the next few weeks until my own book finally sees the light of day. Go buy Rebecca's book! Hurry! Then go buy my book! You can pre-order it and receive one of the first autographed copies off the press.